Though I haven't sampled every single walk in the Blue Mountains, based on popular recommendations, heresay and over twenty years experience as a local, I will have a crack at answering this popular question. The walks below have been selected based on their scenic value and ease to find and complete for the average tourist with time limitations. 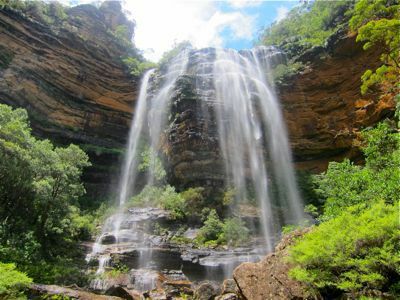 They include convenient locations and those further afield of the main tourist drag of Wentworth Falls to Blackheath. Take your pick from short walks to day long walks and from highly popular walks to something more secluded. Taking into account the varying needs of walkers (including the presence of children, personal taste, time and fitness) I've included walks to suit all groups and occasions. Perhaps you have a walk you would like to add to this list. May your traverses through the Blue Mountains wilderness be safe and trouble free. 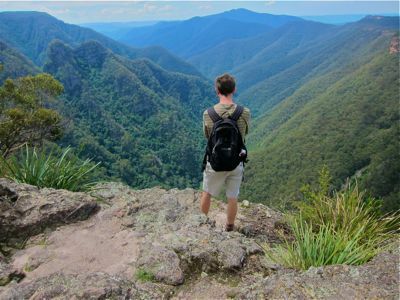 Spectacular scenery and well maintained paths make the Valley of the Waters National Pass Trail a popular Blue Mountains walk. For varied scenery, drama and spectacular waterfalls, there's no matching the National Pass Trail of the Valley of the Waters. Add renovated, award winning paths and a cafe at the end (or if you prefer the beginning), and this walk has it all. I first took this walk as a teenager and never forgot it. Since then, I've never discovered anything better. The National Pass Trail is best thought of as an all-day excursion. It takes approximately three to four hours to complete as a round trip, but will take longer if you succumb like so many others to lengthy rest breaks at the waterfalls or to spending too much time behind the lens of your camera. While there are other walks within the Valley of the Waters, the National Pass Trail, taking one deep into the rainforest canyons then climbing up to the scenic cliffs, is in my opinion the best of this bunch. The National Pass Trail takes you deep into the rainforest canyons, past numerous waterfalls and up into soaring cliff top ledges. This very popular walk can be like Pitt street on a long weekend. Okay, not quite, but you get the drift. Graded 'hard', the climb out can be a little exhausting, but if someone as unfit as myself can accomplish it, you can too. For comprehensive information about the Valley of the Waters, National Pass Trail, including directions, read my article "Valley of the Waters, National Pass Trail" here. 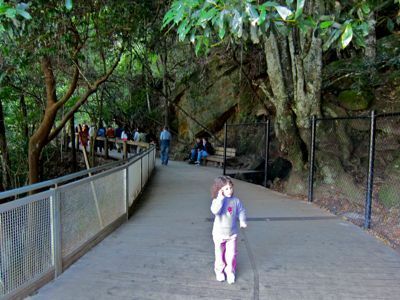 Scenic World platform walk - very safe for small kids and will save your back too. An elevated board walk through the rainforest, railings barricading all those steep falls and a replica coal mine for kids to look at, make this 2.4 km walk an easy option for parents. The Scenic Railway or Cableway means you won't have to carry any tired little bodies back - but, it will cost you. Parts of the walk are wheelchair accessible - you get down to the forest and back up to the road via either the Scenic Railway or Cableway. The downside is it feels like half the world is down here with you too. Kids who like to get up close and personal to nature by touching stones, flowers and leaves or walking through creeks, may feel frustrated. 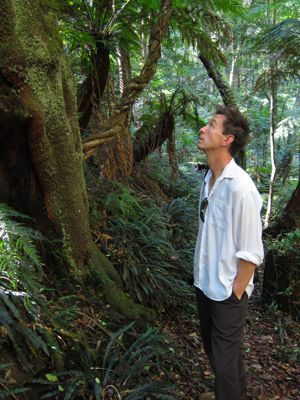 The upside is a genuine, safe and shady experience of the rainforest and the wondrous sounds of the local lyre-bird. Further walks can be undertaken from the platform walk for those who want to continue exploring. 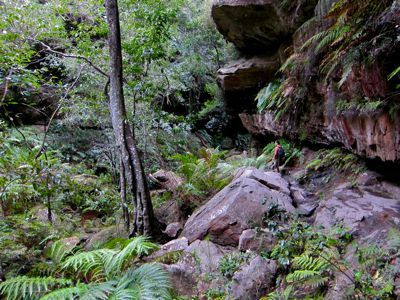 Check out the Scenic World website and review their costs and other information. The walk itself is free but the Scenic Railway, Cableway and Skyway aren't. Scenic World is located on the Corner of Violet Street and Cliff Drive in Katoomba. Please note Scenic World is closed until 28th March 2013 due to redevelopment. Parts of the walkway are temporarily closed as a result of extreme weather damage. If you are planning a visit, check their website for an update. Graded "moderate" this short 30 minute circuit walk of 0.8 kms length takes you to a waterfall. There are a few short, steep hills and steps in which little ones or the feeble may require assistance. There are also hand rails. This is a popular tourist walk and includes walking past streaming waterfalls, large ferns, some decent cliff top views and a lookout. It's easy to access - there is plentiful designated parking and facilities and a picnic ground. 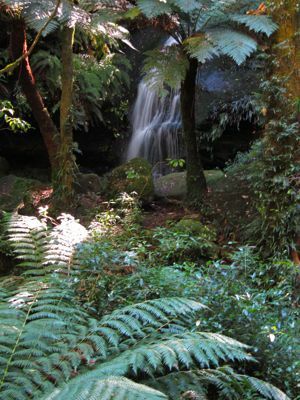 From the Leura Cascades you can take many other walks. Leura Cascades loop walk - cliff top views not bad too. The car park to Leura Cascades can be found on Cliff Drive between Katoomba and Leura. The area is well sign-posted. The waterfall walk at Mount Wilson. Men with big cameras seem to know this walk and a few couples stray here, but it's largely unknown. If you aren't planning a trip to Mount Wilson, it's probably not going to be that practical, however if you do step into this neck of the woods you won't be sorry. Mount Wilson is about 2 hours West of Sydney taking the Richmond route. From Katoomba, it's about 45 minutes. Mossy, jungle atmosphere in the Waterfall Walk. Beware the killer mozzies. 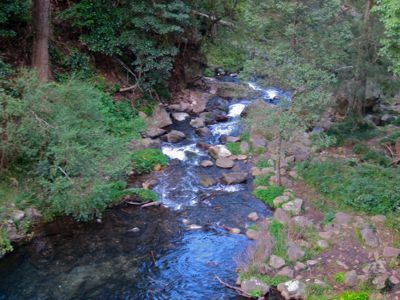 For all you need to know about the Waterfall Walk, including getting there, see my article Escape to Mount Wilson Village. Scroll down until you get to the section on the Waterfall Walk. The Waterfalls Walk takes approximately one hour and takes one past two views of the waterfall, mossy grottos and through dimly lit vistas of fern filled rainforest. Don't expect any cliff top views or sunshine down here - you are down in it. Although only an hour, it will tire you out. The walk starts at Waterfall Reserve (a picnic area) and returns one back there. Just a warning - wear clothing that covers your skin well. The mossies here are little vampires. For a combination of water and mystical atmosphere, the Blue Lake River Walk at Jenolan is my favourite. 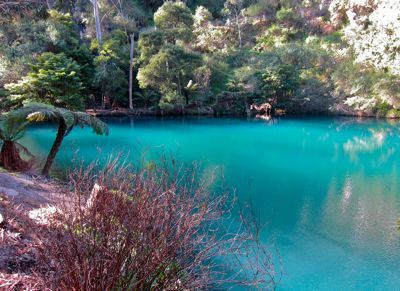 Four things make this walk superb: the location at Jenolan Caves, the exquisite colour of the naturally occurring blue pool (the result of limestone sediments), the constant hiss and roar of the small running river and the slightly softer foliage provided by lime green nettle and the random conifer. Well, that's my opinion. You may have a different take. Blue Lake River Walk, Jenolan Caves - the magical blue pool. The 2.6km Blue Lake River Walk takes one and a half hours to complete as a round trip. There are other walks in the area including the Nettle Walk and the Devils Coach-House. For more information about these and the Blue Lake River Walk, click on this link to my article "Jenolan Caves Blue Lake River Walk". The walk is graded 'Easy' to 'Moderate' and pathways are good. Close to facilities (like public toilets and a kiosk / cafe) at the Caves, this walk is suitable for children. The river walk takes you downstream then loops back to the caves. 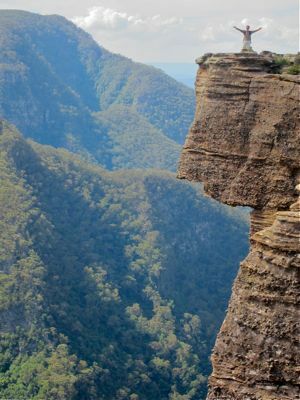 Kanangra Wall cliff top walk - one of the most dramatic cliff-top walks in the Blue Mountains, but, due to the unfenced 70 metre drop, unsuitable for children. Despite possessing one of the most awesome views in the Blue Mountains, few make it out here on account of the long road trip, including 30km of unsealed road. 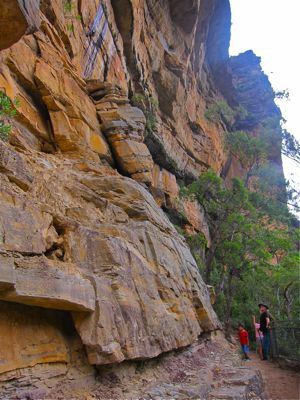 From Sydney, it will take you from 3 to 3 and a half hours to reach Kanangra Walls. If you do make it, it will be worth it. 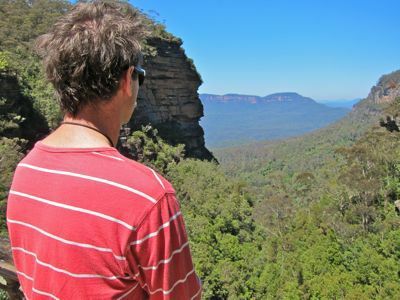 The view from the sandstone Kanangra Wall is listed on Australian Traveller's Top 100 Best Views in Australia. If you like wild, rugged wilderness, this is the walk for you. From Sydney, follow the Great Western Highway through the mountains till you get to Hartley. Turn left into Jenolan Caves Road (there's a sign to the Caves) then once you pass through the Caves follow the signs on to Kanangra Walls Road. Watch out for wildlife on the 30km unsealed road section. On my last trip I passed an echidna and snake. Wombats are said to be common too. You know you've arrived when you reach the carpark. The road stops here - another indicator. From here enter the path through the bush. 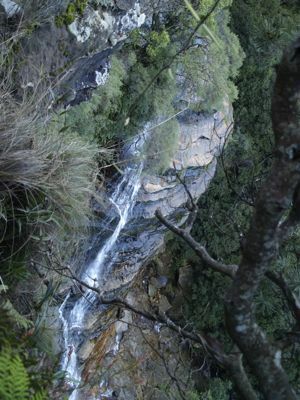 From there you can take the Lookout Walk, the Waterfall Walk and the Plateau Walk along the Kanangra Wall. The walks are well sign-posted. As the Wall is unfenced and a sheer 70 metre plunge ensues, I would highly recommend not to bring children. The walk to the lookout is very short and is even wheelchair accessible, but be aware the lookout isn't fenced and it's a long way down. 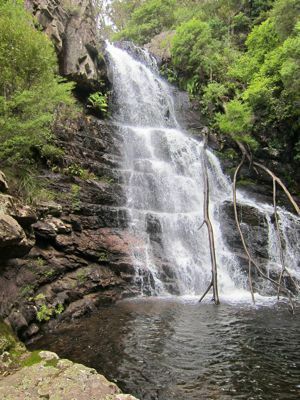 The stoney Waterfall walk finishes at this quiet pool, fed by the Kalang Falls. There are no petrol stations, shops or conveniences in this wild place. In my experience, the heath covered Kanangra Wall walk lacks shade and tends to be very hot. Bring a hat, sunscreen and sunglasses, but most of all some water. Come prepared. Despite the name, this isn't anything like its' namesake - the Grand Canyon in the US. Just thought I'd make that clear so there can be no disappointment. 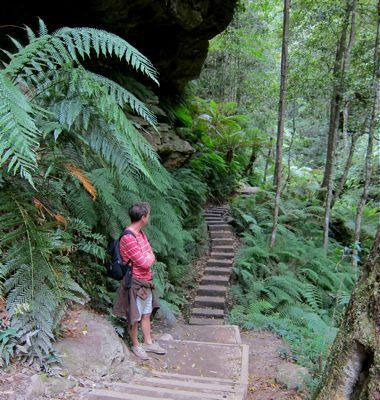 Nevertheless, it's considered one of the best walks of the Blue Mountains. The Grand Canyon is a variable walk that takes one down a deep gorge. 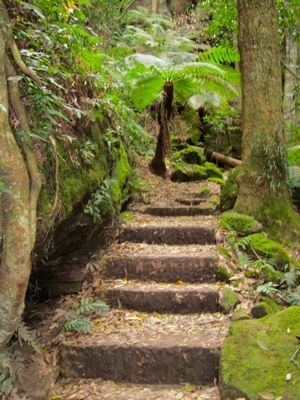 The walk includes looking up at rock cliffs, passing through a dark cave tunnel, wildflowers, ferny rainforest, scrambling over rocks through a creek and green mossy paths with a fairy-dell like charm. The Grand Canyon walk - large scale. I wouldn't recommend this for young children or for those who don't like lots of steps. A small section of this rough track has no actual path and will have you climbing over large boulders and other obstacles. There are many steep gradients and the walk out is a killer if you're unfit. Of course, this can add to the adventure. The last time I was there (in late 2012) there were masses of air-dropped stone pillars lying about suggesting a better pathway might be on the cards. Grand Canyon walk - some parts have a fairy dell like charm. This walk is graded "hard". The worst part is the return ascent. Remember, that what goes down must come up. I did make it, but let's just say that part wasn't fun. The walk is 5.4km long and takes about 3 and a half hours - add time for resting. As most of the walk is down in the canyon, it's fairly cool, thus makes for a good summer walk. To get to the Grand Canyon walk, from Sydney take the M4 to the Blue Mountains. At Blackheath (two towns past Katoomba) turn right into Evans Lookout Road. Turn right again into a car parking area in the bush. It can be a little tricky to find the starting point. You need to find the sign to Neates Glen and follow that till you find the Grand Canyon Track sign. I suggest you use the detailed track notes supplied by the Wild Walks website otherwise, it's easy to get lost at this point. Once you find the track it's all very straightforward. Why? Add scenery and fitness to your Blue Mountains experience. When: Anytime of the year, but come prepared for the weather conditions. Cost: Free - apart from the cost of getting there. Hi Linda, thank you for your great recommendations, we just walked the national pass and the Grand Canyon, both fantastic. They seem to have renovated the paths and upgraded the signage because it was all fairly easy to find! Also there's a trail from Evans point to blackheath for any relying on public transport. 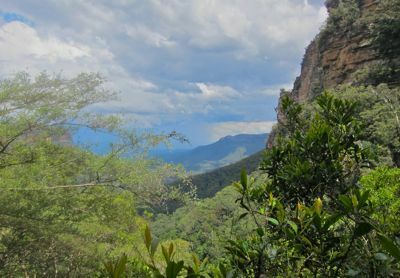 I am a writer and I have lived in the Blue Mountains all my life. I have been walking mountain gullies since I was 9 years old. I have led many groups of children into the Blue Mountains on excursions that I've organised. I have something that I hope your readers will find entertaining. I hope you enjoy it & choose to put it on your website.